Degree-days are used as a tool to predict the development (or phenology) of insects and mites. The phenology models that calculate degree-days (DD) are based on the fact that an insect's growth is closely linked to the temperature around it. As temperature increases the rate of development increases. Basically, the warmer it is the faster an insect develops. This relationship between temperature and insect development has limits. There is a lower temperature threshold, below which development slows to a halt, and an upper temperature threshold, above which development also ceases. These thresholds are different for each insect species. Phenology models calculate how much heat is available for insect development within these temperature thresholds per day - known as degree-days. And this is the reason why insect development and, thus, phenology models do not operate on a calendar-day basis but on a heat unit scale or degree-days. Now, the completion of each developmental stage of an insect requires a certain amount of degree-days, which is different for different insect species. So, the time it takes to complete a certain developmental stage depends on how warm it is and how many degree-days are accumulated each day. Let’s look at an example: Apple maggot has a lower threshold of 44°F, and the model does not require an upper threshold. Oblique-banded leafroller, on the other hand, has a lower threshold of 50°F and an upper threshold of 86°F. That means that apple maggot starts accumulating degree-days earlier in the season when it is still too cold for oblique-banded leafroller to continue development. Therefore, the degree-days for these two pests are not the same. So, what is the difference to growing degree-days? Growing degree-days are more commonly used for plant development to determine what growth stage apple trees are in, for example. Similar to insect models, these growing degree-day models use a lower and upper threshold (e.g. lower thresholds of 43°F or 50°F). Growing degree-days are usually calculated by subtracting the lower threshold from the average daily temperature for each day, and then accumulating the degree-days. However, this method is not accurate enough to calculate degree-days for insects. Most degree-day models for insects use a sine-wave curve to approximate the daily temperature cycle from day and night (maximum and minimum temperature). There are different ways to deal with insect development ceasing above the upper temperature threshold. 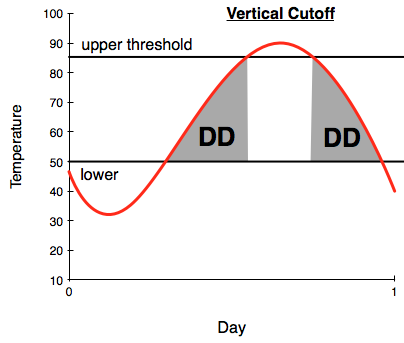 The most common are 1) no upper threshold; 2) horizontal cutoff, where degree-day accumulations above the upper threshold do not count; and 3) vertical cutoff where, once the upper threshold is surpassed, no more degree-days are accumulated until the temperature drops below the threshold again. DAS makes it convenient and user-friendly by automating this process and calculating degree-days for each pest every day (and even 6 weeks ahead) and linking the degree-day sums to management recommendations, so that DAS users are up to date on their pest management information. If you have any questions or comments, please contact us through the Contact DAS link on the bottom of this page or through the Help Center in DAS.